Elise Taylor has made her mark in her profession since graduating in 2010 and has a bright future ahead. After completing her Bachelor of Pharmacy, Elise worked as an Intern Pharmacist for *Capital Chemist for 12 months, registered as a Pharmacist and now manages that same pharmacy with 30 team members. Elise had this to say to the Spotlight. "Capital Chemist and CSU always challenged me to think beyond my 9-5 job and pursue further ventures. This enthusiasm has greatly shifted my focus, from originally being that of only a pharmacist, to now having roles on committees that advocate for young pharmacists". Elise has now completed studies to diversify her skill set in areas of management (by completing a Diploma of Management), training and assessment (by completing a Certificate IV in Training and Assessment) and finishing a Graduate Certificate in Pharmacy Practice. "My goal is to have the knowledge and education to positively influence my staff, patients, and other people in the pharmacy industry in the ACT to improve health outcomes for all those that come in contact with our services." She added "Pharmacists are highly regarded in the community as a source of easily accessible advice, a friendly face and a trustworthy partner in health. This role, as well as having the ability to help people with their problems, both great and small, attracted me to this profession and in my experience so far, pharmacy has certainly not disappointed me! "I am driven by my passion for the pharmacy profession, and by being surrounded by such amazing Pharmacist mentors both when working at Capital Chemist and when studying at CSU. I believe hard work and dedication will be rewarded in accordance with the amount of effort that is put into a task. Also, having grown up with interactions with the health care system at different times in my life, I don't remember any of my doctors, or nurses, but I remember my childhood pharmacist as being a supportive friendly face in a time of illness and I hope that I can be that same face to my patients when they are in bad health." 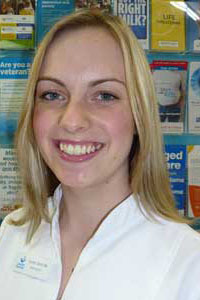 Elise quotes her strongest influences as her father and the two female owners of the Pharmacy she is managing. "My Dad is my ultimate role model and his work ethic and determination are traits which I believe I have inherited and contribute strongly to the opportunities ahead of me today. When asked if she could provide advice for young graduates she commented “The profession of pharmacy is changing, and I believe that this is an exciting time to take advantage of the diverse range of roles available to pharmacists. I believe being unique is the key to success, and this will be particularly important to new graduates of pharmacy who may not slip into the traditional roles of hospital pharmacist or community pharmacist as graduates before them have. But, young graduates will be welcomed into a growing industry that has the capacity to evolve positions for pharmacists that haven't even been thought of yet... The future of pharmacy is changing, and will ensure exciting opportunities for those brave enough to step outside the square!" *Note: Capital Chemist is a donor to the Charles Sturt University Foundation Trust, providing three scholarships to Pharmacy students studying in Orange and Wagga Wagga. For more information on how you can support our students see Giving to CSU.